In any case, one thing they did great was dessert. 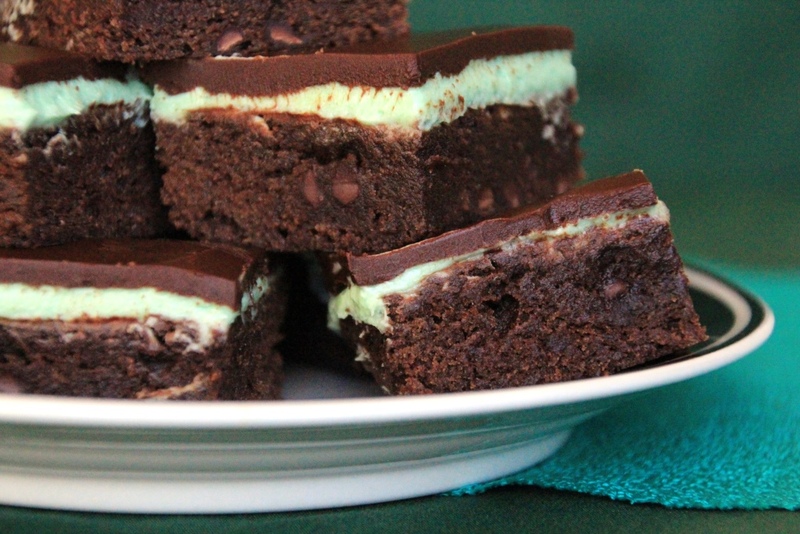 In particular, mint brownies. These were hands down the favorite of M and he used to watch the menu for Mint Brownie Day (as he called it) so he could be sure to have as many as possible. I will admit they were quite delicious even though I’m not normally a fan of frosted brownies. I have since tried several recipes in an attempt to recreate them, and while I’ve not been 100% successful, this recipe is pretty dang good. Chocolatey brownie, creamy mint, shiny ganache, and best of all: no melting anything on the stove. I’m very lazy when it comes to brownies because there’s really nothing that beats the Ghirardelli box mixes in taste, texture, or convenience. But I decided to do the from-scratch thing on a whim because it’s good to remind myself I can actually make brownies for real. Two weeks later, after searching Pinterest high and low, I Frankensteined together my own recipe from three separate ones. Dense chocolatey brownie, creamy mint frosting, and that same shiny ganache come together in a delightful combination with no stove required. The lazy baker in me is thrilled about that last bit. Below find the recipes for each layer with my adaptations. These freeze great so make a batch, pop in the freezer, and enjoy at your leisure. They are pretty rich so likely they’ll last you awhile, but I certainly won’t judge you if they don’t. For the brownies: Preheat the oven to 350 degrees Fahrenheit. Line an 8×8″ pan with parchment paper and spray with cooking spray. Set aside. Combine butter, sugar, cocoa, and vanilla in the bowl of a stand mixer. Stir together on low until well combined. Add eggs one at a time and mix well after each one. Mixture should be pretty smooth. Add flour and salt and mix until just incorporated. Stir in chocolate chips, if desired. Spread evenly into prepared pan and bake for 25 minutes, checking a few minutes early to make sure they don’t over bake. A toothpick should come out a teensy bit wet. For the mint filling: In the bowl of your stand mixer, combine powdered sugar, butter, and vanilla. Mix until completely combined and fluffy. Add desired amount of Creme de menthe, mixing well on high speed each time. Filling should be fluffy and somewhat lightened in color when it’s ready (this will take a minute or two). Spread on top of cooled brownies and place in the freezer while you make the chocolate ganache. For the ganache: Put chocolate chips and butter in a microwave-safe bowl, heat for 30 seconds, stir, and repeat 3x or until mixture is completely smooth. Pour chocolate topping over the mint frosting and gently tilt the dish to coat entirely. Let sit on the counter (or in the freezer) until chocolate has set. Cut and serve immediately or cover and return to the freezer for storage. For pretty slices: Gently cut forward and back until you are through the ganache, then press firmly down, wiping off the knife if anything sticks to it. This will prevent the chocolate from cracking. Photography tip: Pick up from the sides to avoid fingerprints.